Entrepreneurs, like military leaders, know that you often have to lose a lot of battles on the way to winning a war. So why do we always end up talking about the goals, the accomplishments, the victories, rather than the scary stuff? What about the traumas that stay with you long after you’ve left the daily calamities of the business battlefield? Join us December 4 for ‘War Stories’, a fireside chat with entrepreneurs who have learned that what makes us successful comes more often from our hardships than our victories, and hear the real untold stories behind the success. 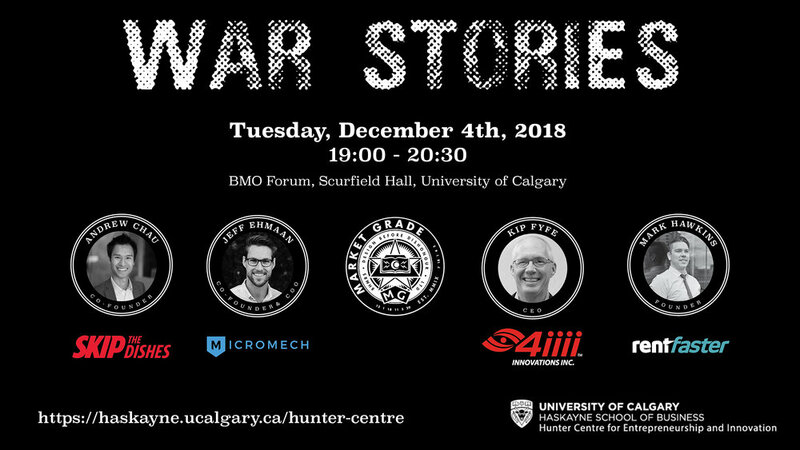 War Stories is a Market Grade initiative generously supported by the Hunter Centre for Entrepreneurship and Innovation at the Haskayne School of Business.